Thorough cleaning and sanitizing of food-handling machines and equipment is a requirement, but the task becomes easier and faster when upfront consideration is given to sanitary design. With implementation of the Food Safety Modernization Act (FSMA) under way, sanitary design migrated from a nice-to-have to a must-have for the processing and handling equipment inside food & beverage manufacturing facilities. Cleanability has moved from afterthought to a central consideration in total cost of ownership of equipment, particularly when there is direct contact with food. FSMA extends that consideration to include incoming materials, both food and nonfood, environmental conditions and the physical structure. Cross contact with allergens receives special attention in Hazard Analysis and Risk-Based Preventive Controls for Human Food, the FDA guidance document issued in August. Building and equipping a plant from the ground up is one way of addressing sanitary design, but the vast majority of companies must work with the facility they already operate. Fortunately, even legacy sites can clear the higher sanitary bar, as evinced by General Mills’ $25 million commitment to its 110-year-old Buffalo, N.Y., cereal plant. Guidelines for equipment design have existed since the 1920s, when the 3A certification program for dairy processors was created. A broader hygienic view began coming into focus 12 years ago, when a working group of meat processors and architectural engineers established 11 facility design principles. Working on behalf of the AMI Foundation, they advocated distinct and separate hygienic zones, control of airflow and humidity, cleanable walls and ceilings and a tight building envelope that keeps pests out. Design principles for both the facility and the equipment take aim at standing water and advocate surfaces that are “cleanable to a microbiological level.” That expectation has shaped the design of much of the processing and handling equipment placed in service in the past decade. Sloped surfaces, radial corners and hermetically sealed hollow tubing are routinely incorporated into the machines, conveyors and other food-contact equipment built by many OEMs. Sanitary design principles guided the re-engineering of Capway’s Captilever depanner, renamed the Provident. When in operation, a protective cage surrounds the unit for worker safety. Photo: Capway Automation Inc.
Those principles guided re-engineering of a basic depanning system from Capway Automation Inc. (www.capwayautomation.com), a York, Pa., supplier of bakery equipment. Dubbed the Provident, the machine is rated IP69K for high-pressure washdown and cleaning with caustic chemicals. “FSMA is why we did this,” according to Bob Harrington, a principal and vice president at Capway. Many pizza manufacturers are subject to USDA oversight, and meat and poultry companies are acquiring bakeries as they migrate toward value-added products that are enrobed in dough, he says. As a result, Capway considered USDA guidelines and 3A standards when designing Provident. But FDA’s FSMA guidance clearly distinguishes between wet and dry processing environments and suggests any water use should be on an as-needed basis. 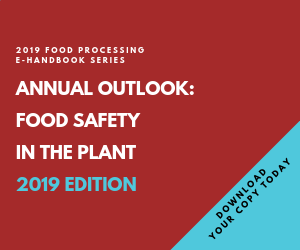 “Water in a dry environment is one of the most significant risk factors for Salmonella contamination,” providing the essential ingredient for microbiological growth, the August guidance points out. The decision to rely on sweeping, brushing, scraping and vacuuming to clean equipment surfaces or follow a controlled wet cleaning approach often comes down to the risk assessment of bakery personnel. Guidances for low-moisture foods from Grocery Manufacturers Assn. and PMMI’s OpX Leadership Network allow for both approaches while emphasizing the need to thoroughly dry the equipment and evacuate standing water. The GMA and OpX initiatives are helping establish standardized approaches to sanitary design, allows Jim Ruff, general manager-integrated solutions group at Key Technology (www.key.net), Walla Walla, Wash. However, Key’s vibratory conveyors and sortation machines are as likely to be found in a plant producing cheese or poultry as one making low-moisture foods. “They’re getting there, but there’s a ways to go,” Ruff says of the OpX guidance. “We have that information already from our customer base,” and the sanitary level of a machine is more a function of what regulations a food company must comply with and how much it is prepared to spend. Sanitary conveyance drives most processors to vibratory and away from belt conveyors, he believes. A stainless steel pan is inherently more cleanable than a belt. The key differences with vibratory conveyors are the pan’s finish and the type of welds used in its fabrication. TIG welds and ground and polished welds are available options, but unless the product is ready-to-eat or further processed, few companies are willing to pay the premium. Some equipment subcategories are under particular sanitary scrutiny. Bucket conveyors in particular are targeted because of the challenge they pose for thorough cleaning and the cross-contamination consequences they present. One of the most successful product launches by Dorner Manufacturing occurred recently with VBT (short for vertical belt technology), a sanitary incline conveyor that can operate at 90 degrees and features sidewalls that are RF-welded along only a fifth of the unit’s length to make cleaning faster and more effective. VBT follows in a trail blazed by Dynamic Conveyor Corp. (www.dynamicconveyor.com), Muskegon, Mich. Introduced five years ago, its vertical conveyor features removable retaining walls with corner rollers that eliminate the need for a belt tensioner. A second U.S. patent for the design was issued in September for concepts that eliminate bearings, shafts, wheels and fasteners or lubricants. Conventional plastic buckets become brittle over time, raising concerns that pieces will break off and contaminate the product, according to Jill Batka, Dynamic’s president. “People don’t like bucket elevators for a variety of reasons,” she says. She calculates cleaning and sanitizing can be accomplished in half the time with her vertical unit, thanks to a limited number of catch points and tool-less assembly and disassembly. Materials of construction are a sanitary factor, and 304 and 316 stainless steel have evolved into industry standards. Cleanability and durability have made stainless the material of choice for most food-contact surfaces, and some suppliers are taking stainless to a higher level with electroplating. Among them is Donaldson Co. Inc. (www.donaldson.com), a Bloomington, Minn., maker of membrane filtration systems. Donaldson applied 3A criteria to the internal welds and crevices on the inside of its filter housings to lower the probability of bacteria remaining after backflushing. Engineers also applied an electroplated surface finish that reduces pores to less than 32 micro-inches (1 micro-inch equals one-millionth of an inch), according to Colter Marcks, lead development engineer. Even less porosity is possible, “but smoother isn’t always better,” he cautions. “When a surface gets too smooth, microscopic electro-adhesion forces can come into play,” Marcks explains. Regardless of how clean a piece of equipment is at the beginning of a shift, a degree of contamination during production is almost inevitable. Swab tests can provide limited assurance that pathogens are not present, but product sampling generates a more representative picture. Sixty discreet samples per hour result in a 95.6 percent detection level, according to IEH Laboratories & Consulting Group. Pulling that many samples would be a full-time job, though, and the opportunity for sample contamination would likely result in some false positives. Automated sampling resolves the problem, says AJ Naber, food and beverage industry manager at Sentry Equipment Corp (www.sentry-equip.com), Oconomowoc, Wis.
Sentry recently introduced HRP and HRX model samplers, hygienic versions of previous powder and solid samplers. While improved design is the key to a higher level of sanitation, UHMW or PTFE seals and 316 stainless in all food-contact areas help minimize the potential for bacterial build-up, and a bottle brush may be sufficient for cleaning if there isn’t any build up of oily meal or other nutrients. Eliminating human contact not only is a hygiene consideration, it’s a driver of some of the automated solutions being introduced. A tortilla manufacturer who wanted to remove enzymes and preservatives to attain a clean label asked Robert Reiser & Co. to automate the infeed to Reiser’s vacuum packaging machine. That spurred collaboration with JLS Automation for a pick-and-place robotic system to stack incoming tortillas. Lowering lifecycle costs is a residual benefit of sanitary design, which typically results in easier maintenance and quicker cleaning and return to production. Instead of waiting for OEMs to develop a solution, some food companies are proactively investigating hygienic improvements, according to Darin Zehr, general manager of Commercial Food Sanitation LLC (www.commercialfoodsanitation.com), New Orleans. When attempting to identify flaws in their equipment’s sanitary design, “the ability for an OEM or plant engineer to pull in the people who work with the equipment is where there is a gap,” Zehr observes. He advocates a team approach that includes sanitation workers, quality assurance personnel and, especially, operators. To illustrate his point, he cites the example of Richie, a 35-year employee at a food company whose formal education ended in the ninth grade but whose familiarity with a filling machine exceeded that of the OEM’s people. Richie flagged access to seal heads as a hygienic flaw. Design changes resulted in quicker, safer removal of the heads, an improvement the OEM incorporated in all its fillers. “The principles of sanitary design are the key, but also the principle of engaging the operators,” says Zehr. FSMA growing pains have produced a sometimes-agonizing reappraisal of many aspects of food and beverage production. Sanitary design is part of that critical evaluation, but the long-term affect can include reduced operating costs, as well as enhanced food safety.